The Seattle Art Museum’s latest exhibit is Graphic Masters, an unusual collection of prints and pen and ink drawings by Dürer, Rembrandt, Hogarth, Goya, Picasso and R. Crumb. It was very enjoyable and illuminating to see engravings and other prints by Dürer and Rembrandt that I had only seen in books, and most of the others I had never seen before. Many of the engravings were surprisingly small – maybe no bigger than my sketchbook – and magnifying glasses were available to view the intricate details. 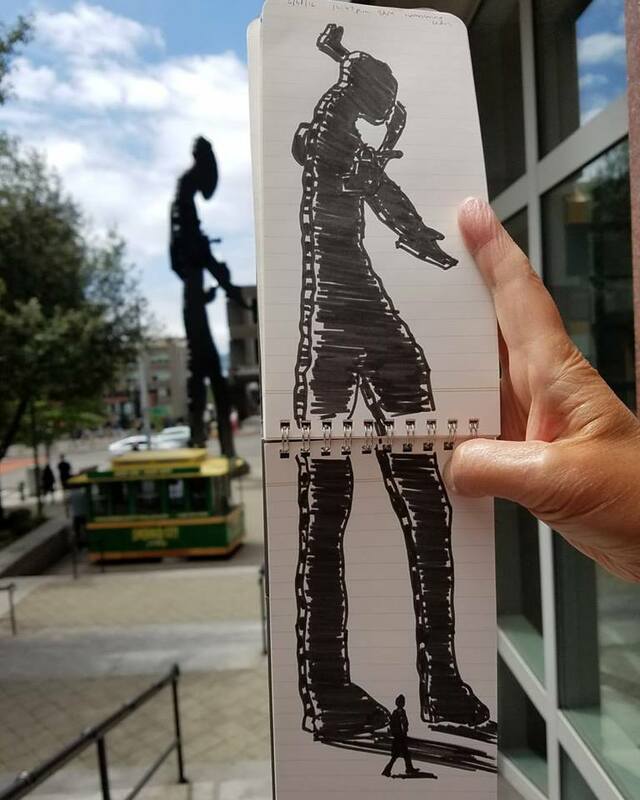 Even though seeing prints in books is not the same as seeing the originals, at least they are often enlarged when reproduced. I left the exhibit with a greater appreciation for all of the works. 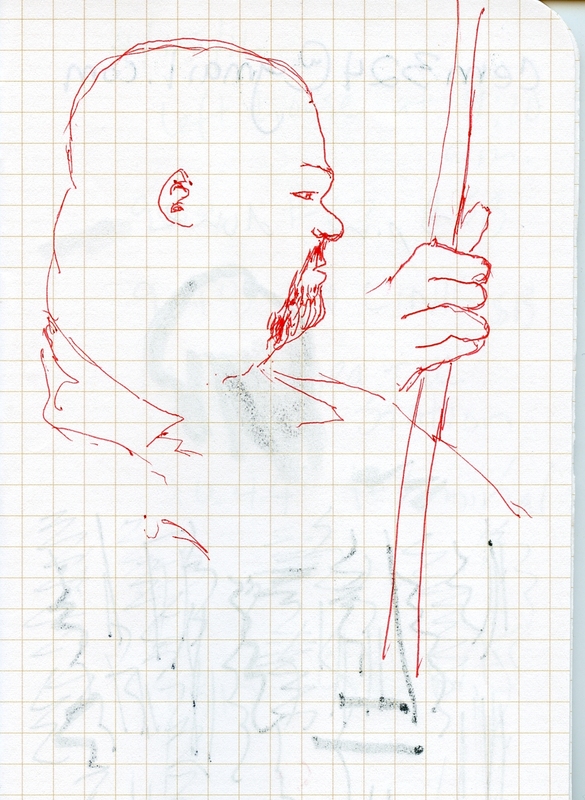 As a sketching opportunity, however, the exhibit was less inspiring; lots and lots of small prints on white walls didn’t exactly grab me. But as long as I was downtown, I made several small sketches of things I saw to and from the museum – the huge Hammering Man kinetic sculpture outside SAM; the small animal heads adorning a building’s planters; people on the bus. 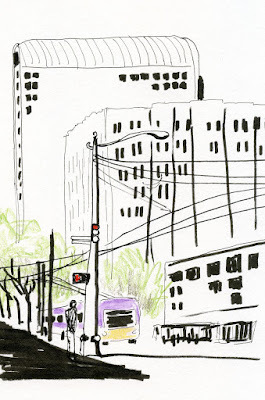 My last sketch before hopping on the bus for home was the street scene at Third Avenue and University. 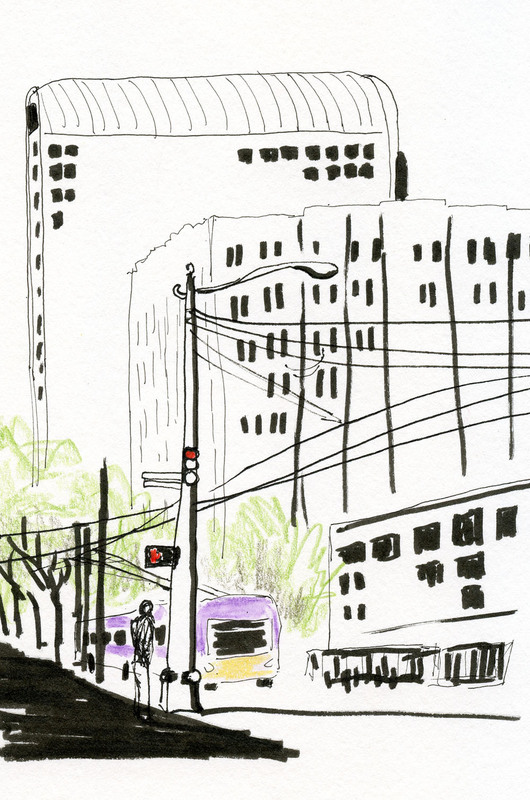 Whenever I see layers and layers of urban buildings plus vehicles, people, street signs, trees and other “street furniture,” I get really overwhelmed and can’t put the elements together into a composition. I’m not at all happy with the sketch above, and it was frustrating after all the fun I had sketching the earlier isolated elements. 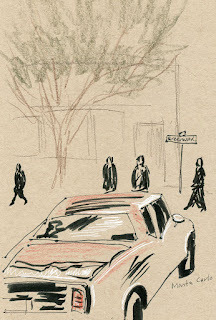 But I know the only way I’ll get better at doing busy street scenes is to do more of them. One of the many things I’ve learned from using Field Notes as sketchbooks is that red is the new tan. 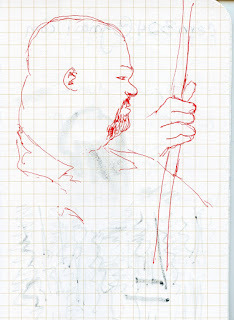 Saturated red paper seems unlikely as a sketching paper, but when I can use only three tones – black, white and the red paper as the middle tone – everything is simplified. Although I’d tried it at various times, traditional tan or gray toned paper hasn’t interested me much – until I started sketching in red Field Notes. And then I started to see what toned paper could teach me. 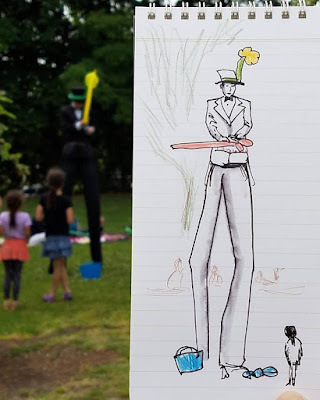 Green Lake Park is very familiar territory for me, and I almost always use color when I sketch there, trying to differentiate the various shades of green in all the trees, their shadows, the grass and everything else. 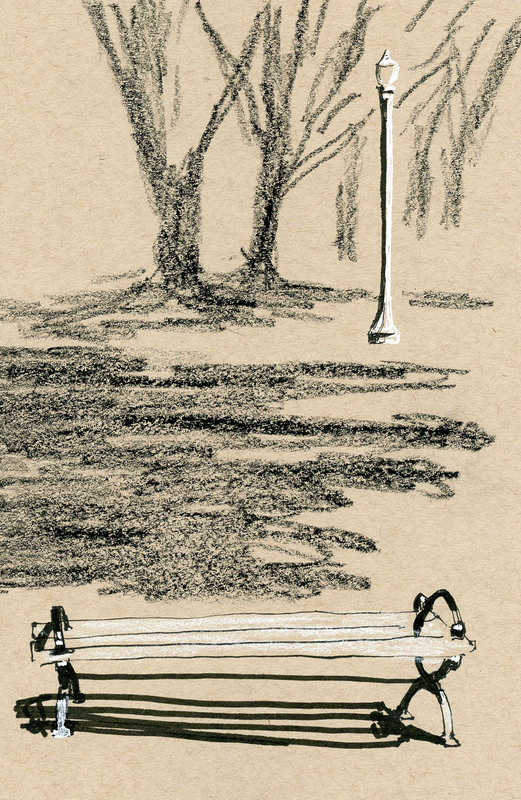 Yesterday I worked hard to simplify a lamp post, a bench and some trees to the three basic tones. 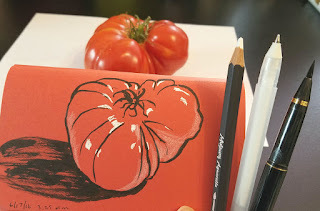 I wanted to retain some of the different textures, however, so I used both a white pencil and a white gel pen, and a black brush pen as well as a black grease pencil. I found myself squinting a lot to see and simplify the tones, and I tried not to worry about differentiating between a thing and its shadow if the tone was the same. It’s hard to do because my brain knows the difference, and I have to ignore it. 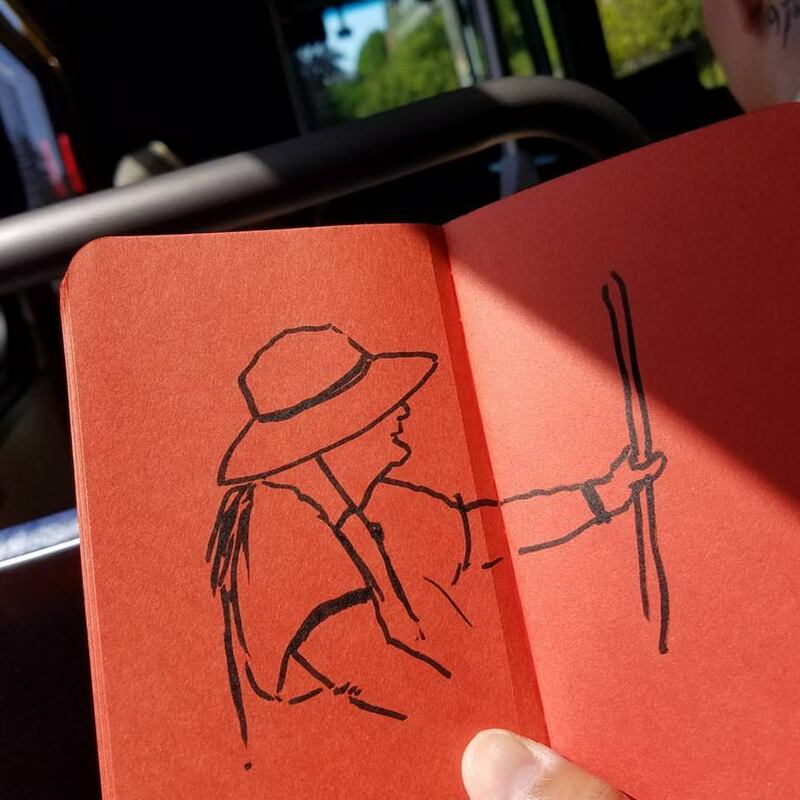 My red Field Notes sketches were mentioned on the Erasable podcast June 15! 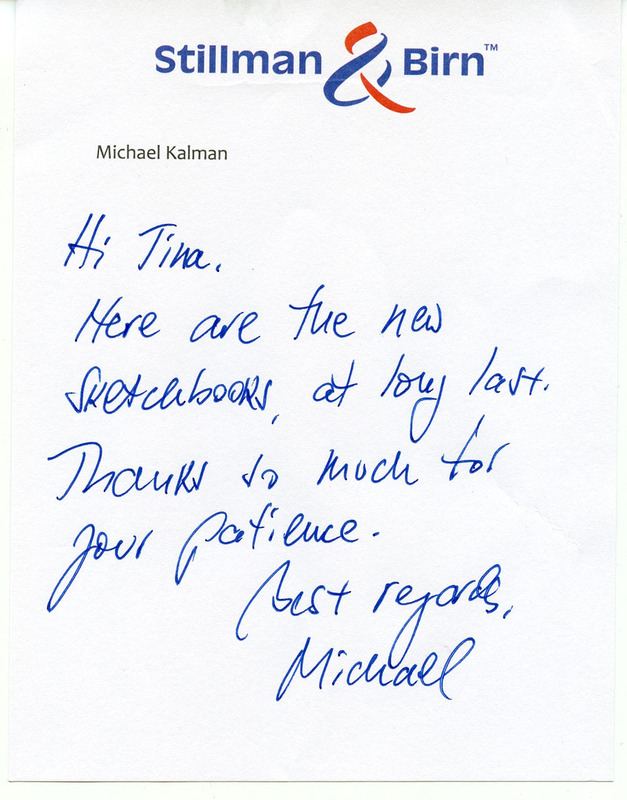 (OK, so I’m easily thrilled, but it’s still an honor to be recognized by the stationery community where I spend so much of my online time!) Hosts and pencil gurus Johnny Gamber and Andy Welfle and their guest host Ana Reinert (whose blog, The Well-Appointed Desk, is one of my favorites) were discussing the Sweet Tooth edition, and they thought of me. Give it a listen, especially around 29:40. Last year at the terminal, I focused on the boats, but it had been a couple of years since I sketched the Seattle Fishermen’s Memorial, a tribute to the people who have died at sea as part of the region’s fishing industry. 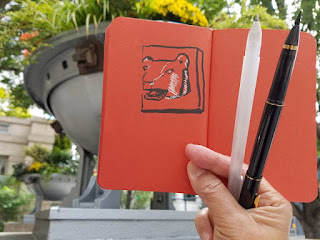 With that in mind, I remembered to bring along my Field Notes Byline reporter’s notebook, whose long, skinny format is just right for tall, skinny memorials. 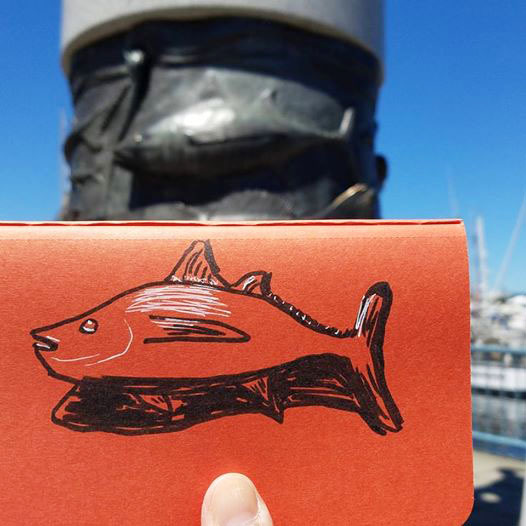 In the small red Field Notes is a detail of one of the many fish at the foot of the sculpture. 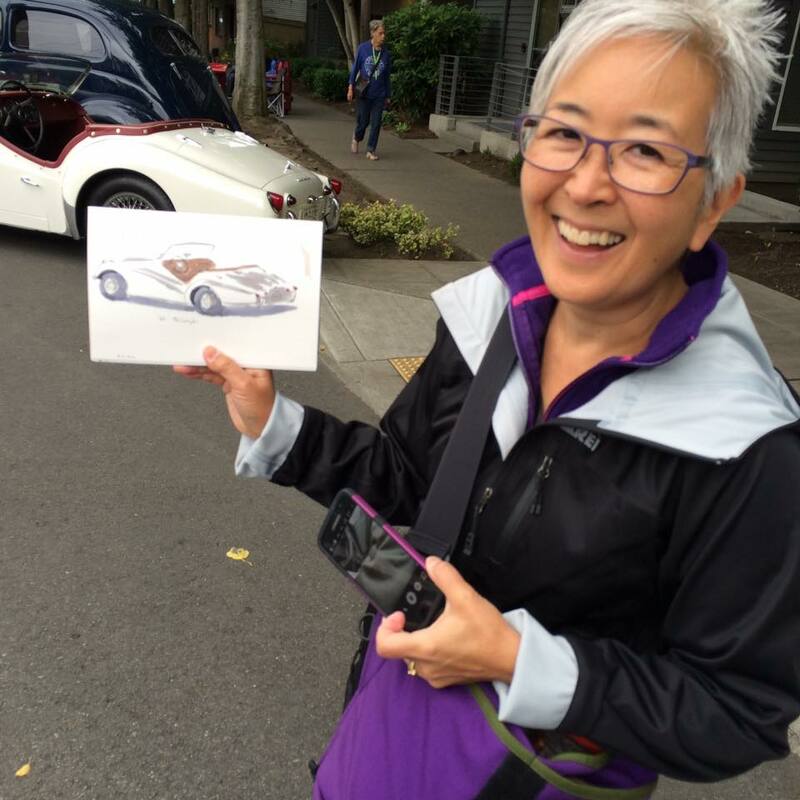 Each June I look forward to sketching at the Greenwood Car Show, “A mile and a half of classic rides” on both sides of Greenwood Avenue. Although it officially opens at 8 a.m., I like to get there before 7:30 to beat the crowds. With hundreds of cars to choose from, it can be overwhelming, so this year I picked a theme: convertibles. A couple of years ago when rain looked imminent, most of the convertibles kept their tops up (and indeed, I got rained out after only a couple of sketches), but not so today. Although the morning started out overcast and cool, rain was nowhere in the forecast, so all tops were down. 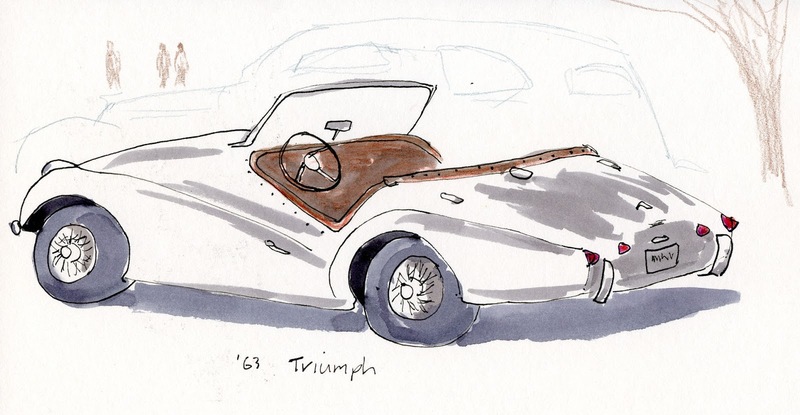 I warmed up with a bright red ’63 Bonneville, which turned out to be my favorite sketch of the day. Next was a cream-colored ’63 Triumph roadster that I would have loved to have taken for a spin! 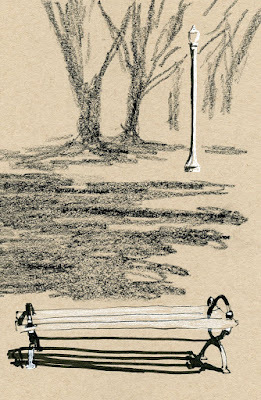 Mid-morning I stopped for a break at Herkimer Coffee, where I sketched the street scene from a bench outside. 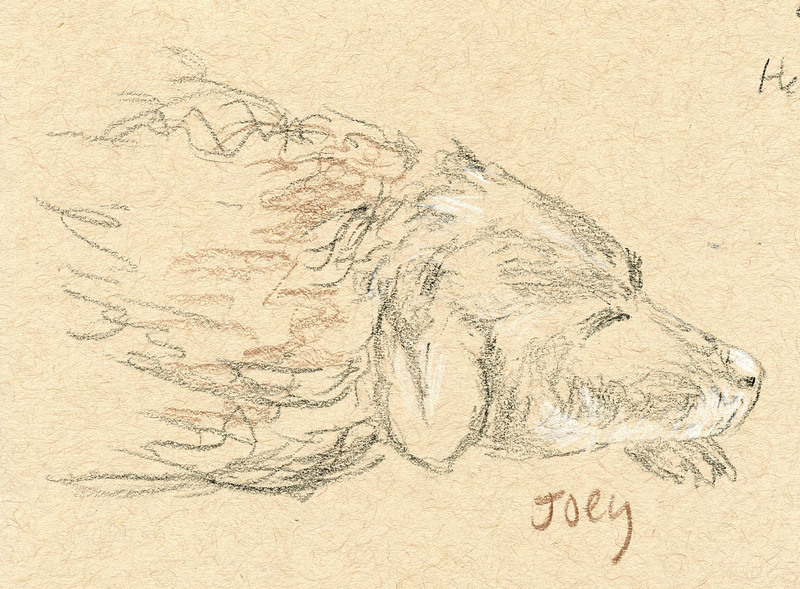 That’s also where I spotted Joey, an old dog dozing on the sidewalk while waiting for his humans to return. 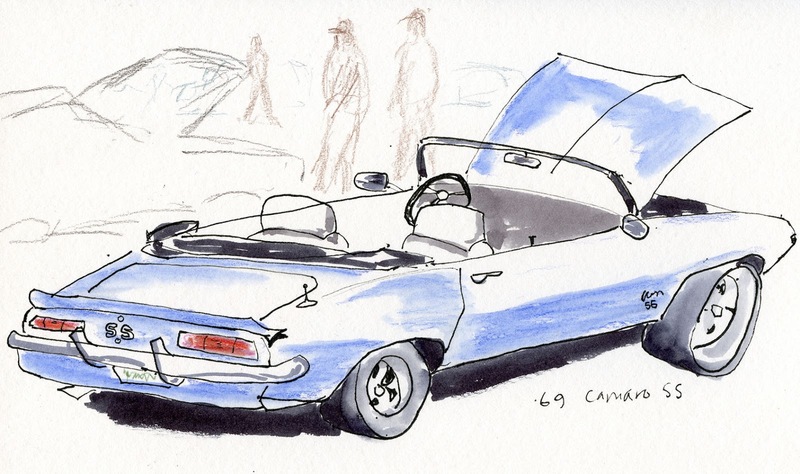 My last convertible of the day was a blue ’69 Camaro SS. By then the crowds were getting thick, so I stepped away from the street to sketch it from a challenging rear angle. 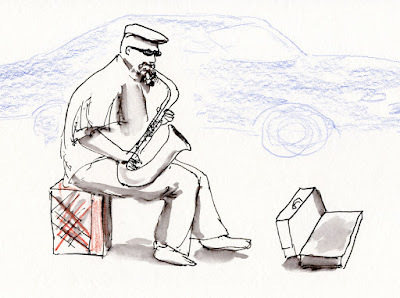 As I walked back toward my own car, I stopped to catch a couple of buskers adding a little jazz flavor to the festivities. It was nearly noon by then, and when I saw the crowds on the slope of the hill on the next block, I knew it was time to go. 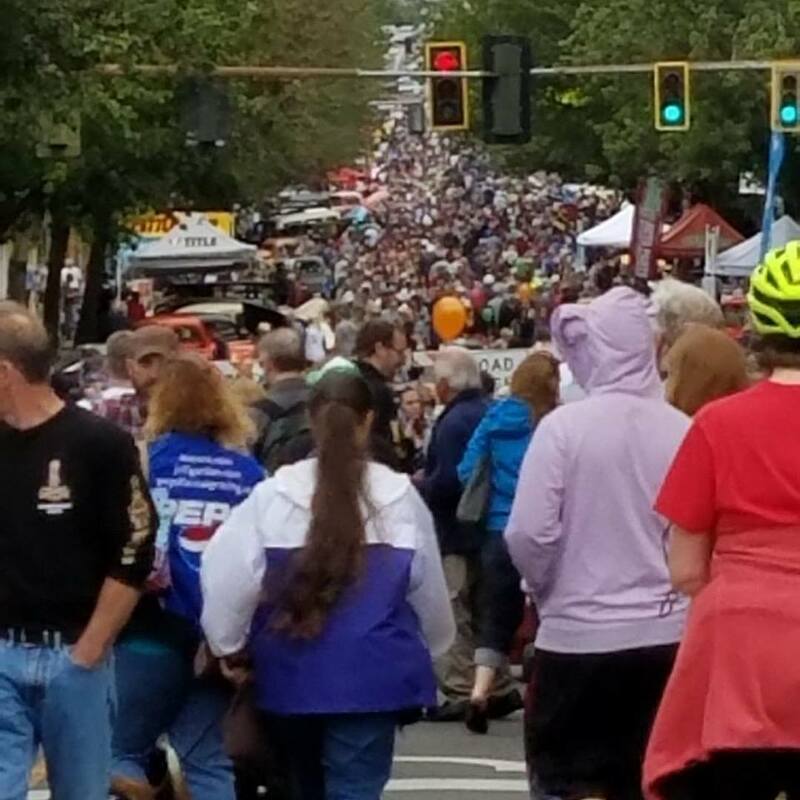 As my own celebration of another terrific Greenwood Car Show, I drove home with the top down. 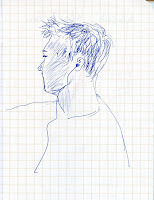 See my sketches from the 2015, 2014 and 2013 shows. 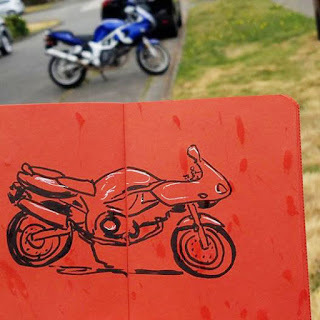 Unlike so many Seattle neighborhoods, Beacon Hill hasn’t changed much since I hung out there as a teenager (I didn’t live there, but many of my friends did). The biggest change was the opening of the Link Light Rail Station in 2009, which now brings a lot more foot traffic to the ‘hood. Knowing that, I was a bit surprised this morning that the immediate area around the station didn’t have more coffee shops and cafés for chilly Seattle Urban Sketchers to retreat to when the day starts out too cold for comfort. 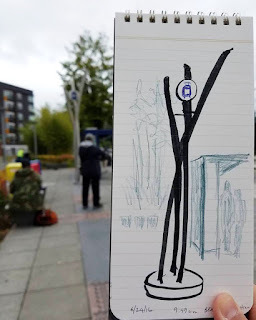 At least that was my thought after I did a very quick “test sketch” of a station sign post to see if I could stand being outdoors all morning. I couldn’t, so I crowded my way into The Station coffee shop, which Michele had told us about. With great funky street cred, The Station is tiny but makes a mean Mexican mocha that definitely took the chill off. After sketching Natalie’s bacon-wrapped biscuit and sampling Gloria’s cinnamon roll, I was sufficiently warmed and fortified to head outdoors again. 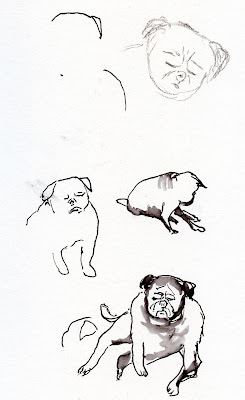 Just outside the door was the shop’s pug, which kept my pen moving. The sun came out, so I gladly took a short walk to check out the ‘hood with Anne and John, who pointed out the Seattle Public Library’s Beacon Hill branch. 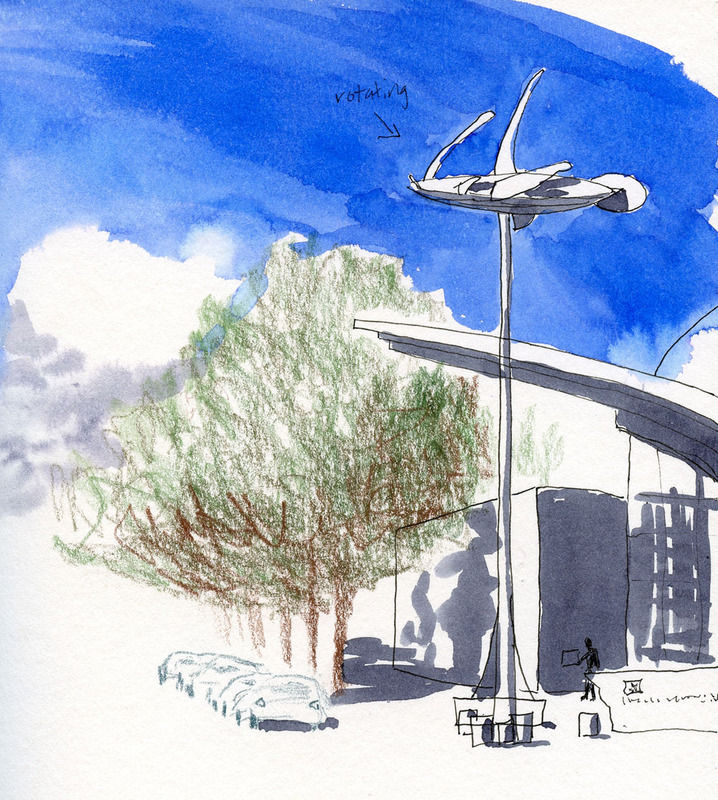 The modern building is topped by The Dream Ship, a sculpture by Miles Pepper that appears to be part boat, part plane. After the challenge of the constantly moving pug, I thought I’d give myself a break by sketching a nice, stationery object. 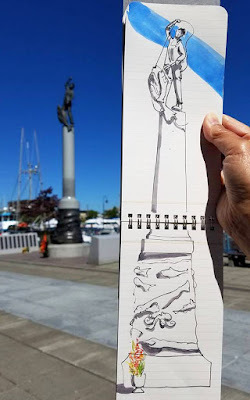 No sooner did I put pen to paper, however, did I realize that the sculpture is actually kinetic, rotating with the wind! 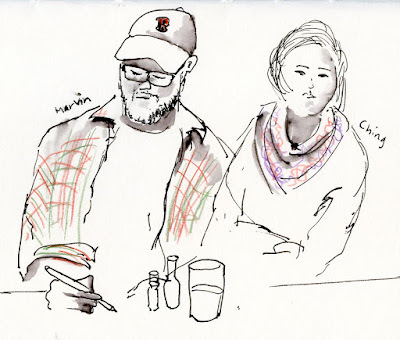 Afterwards at the Baja Bistro, I started sketching Ching and Marvin (who was sketching me and not as surreptitiously as he thought he was) and would have kept going around the table. Fortunately for the others, my burrito came, so that sketch was done. I’ve done my share of whining about Field Notes Brand notebooks. Even though it’s quite obvious that these pocket-size notebooks are made for holding memos or journal entries written with a pencil or ballpoint pen, I kept trying to make them into sketchbooks. I liked the form factor so much – thin, small, inexpensive, easily available – that I kept insisting that Field Notes could meet all my needs for a small, auxiliary sketchbook – if only the paper was better. 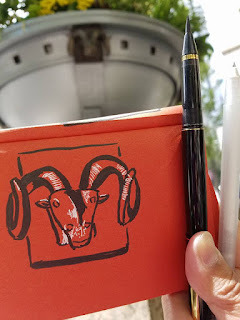 Frustrated, I started making my own, but I still couldn’t resist trying out new Field Notes editions as they came out, just in case the folks at FN decided I was right. 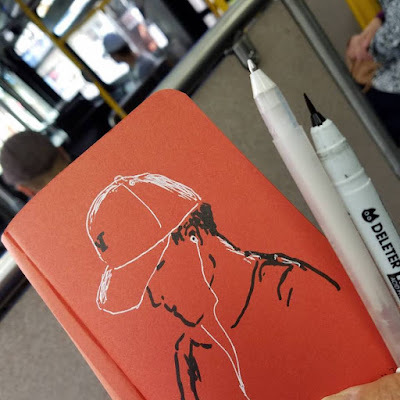 Around the time Field Notes did decide I was right (OK, they didn’t really, but I like pretending they did) and released the Workshop Companion edition, my own attitude started to change. I did and still do enjoy being able to use most of my favored sketching media on that edition’s paper. But it’s a limited edition, which means I can’t count on it indefinitely. 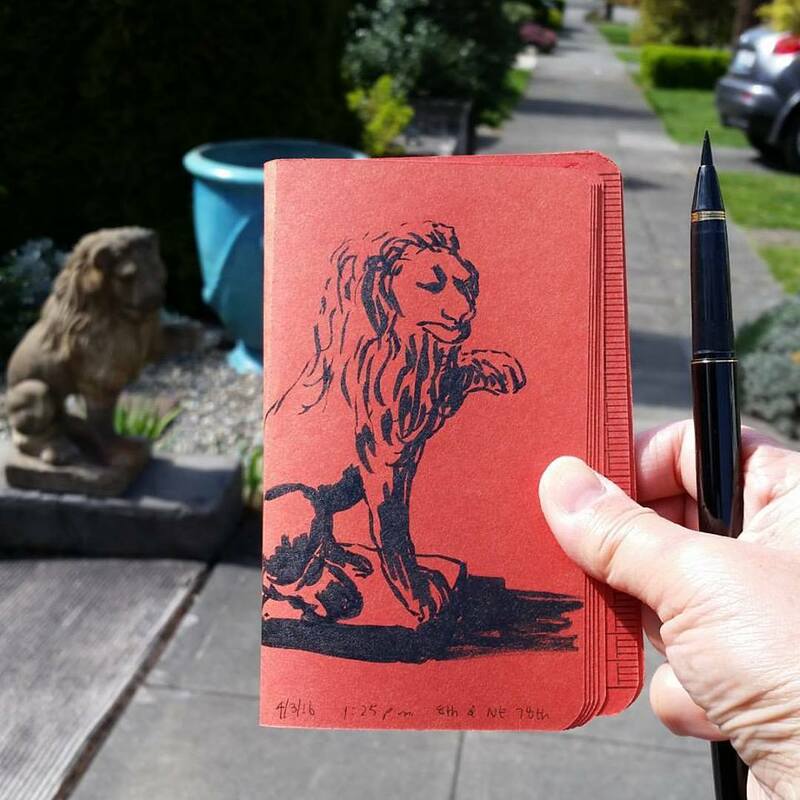 Small notebooks filled with paper ideal for ballpoint pens are ubiquitous. 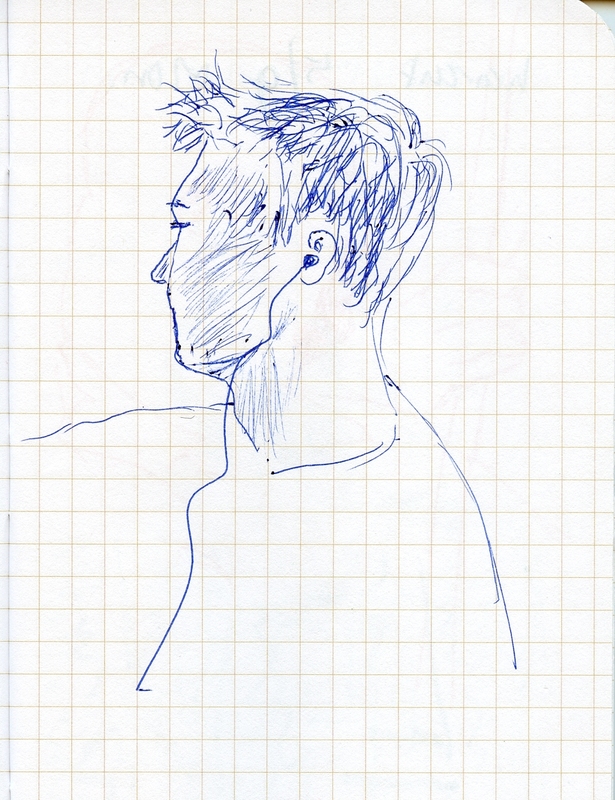 Instead of wishing I could use a fountain pen or paint in them, why not simply sketch with a ballpoint pen? 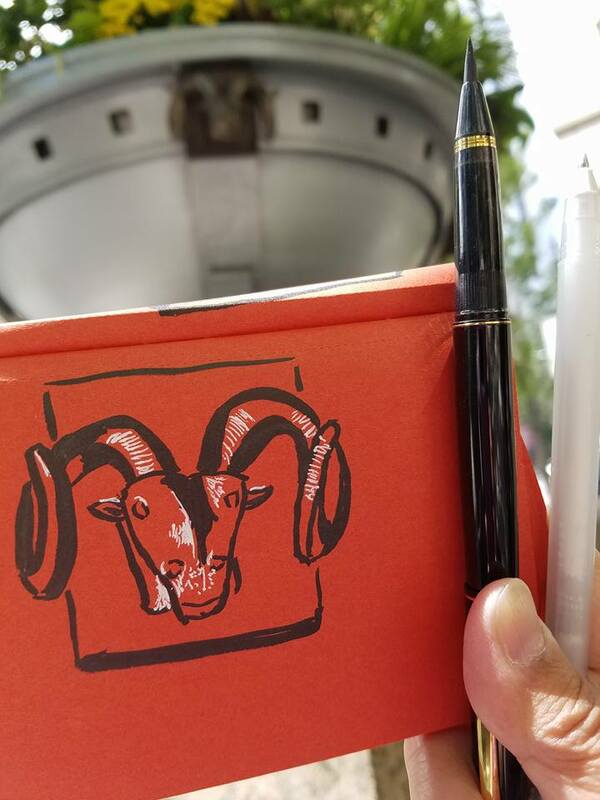 I started grabbing any Field Notes for that, and I was happy. 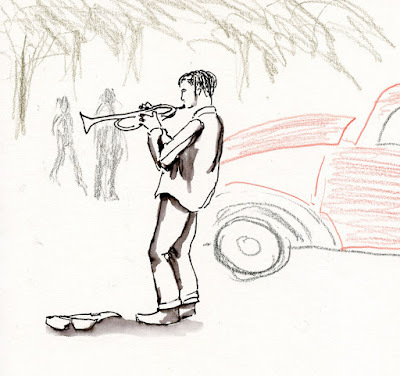 Of course, the release of Field Notes’ Sweet Tooth edition is what really changed my attitude. 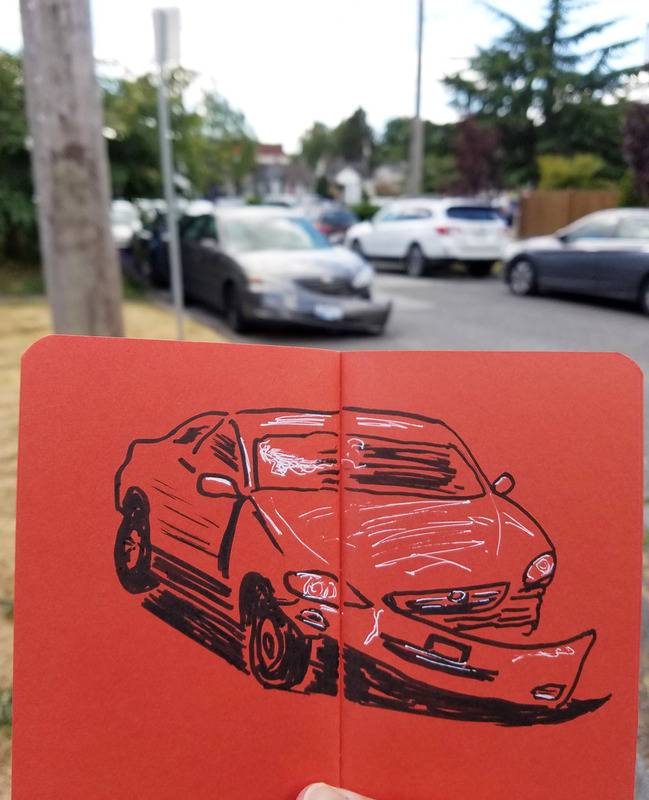 Something about that brightly colored paper liberated me to try a different kind of sketching than I normally do in my “regular” sketchbook. 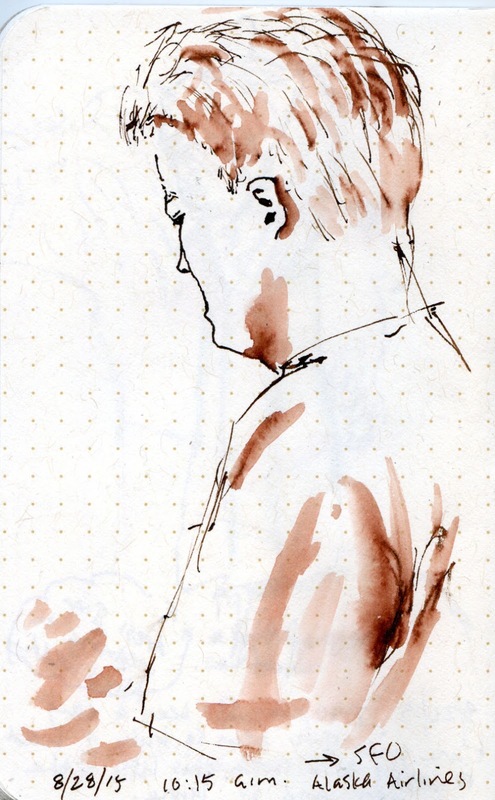 Different media, different subject matter and mainly a different approach – quicker, more casual, more ephemeral. But then one day I was sketching across the gutter of my red Field Notes as I often do, when suddenly it occurred to me: Maybe that long, narrow shape would be good for tall buildings, bridges and skylines. 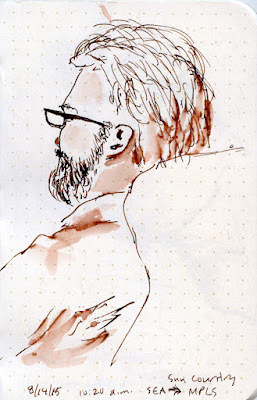 Actually, I have a landscape-format watercolor sketchbook, but I rarely use it; I hardly ever see anything to sketch that would require that format. Or is the other way around? 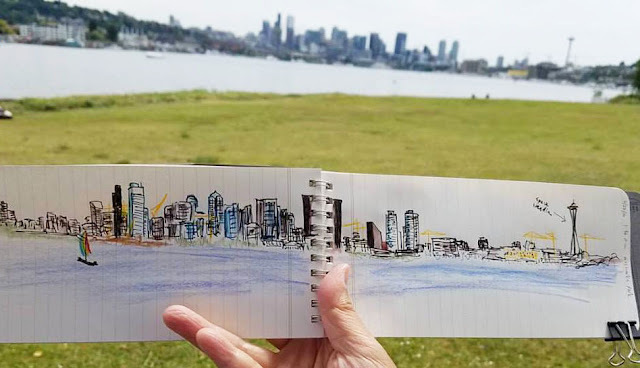 If I happened to carry a landscape sketchbook, would I be more likely to see things that could be sketched in it? 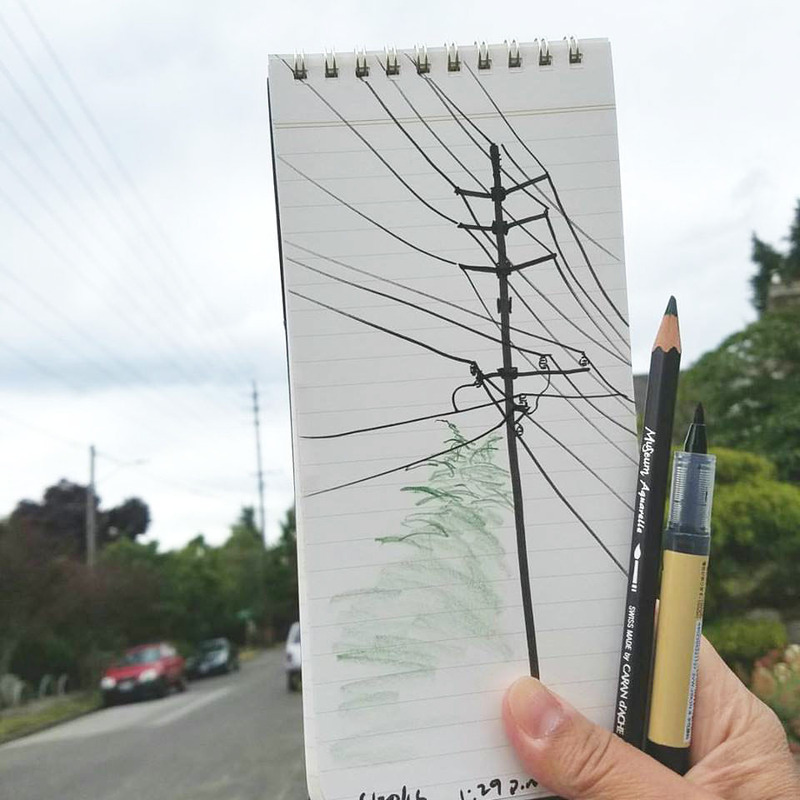 Just the other day as I took a sketchabout in the neighborhood with a Byline in my bag, I noted how different all the many utility poles are. 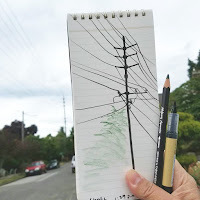 I could probably fill a whole book with nothing but utility poles! It’s an existential question: If I hadn’t had a Byline with me, would I still have seen a balloon man in a tuxedo standing on stilts? 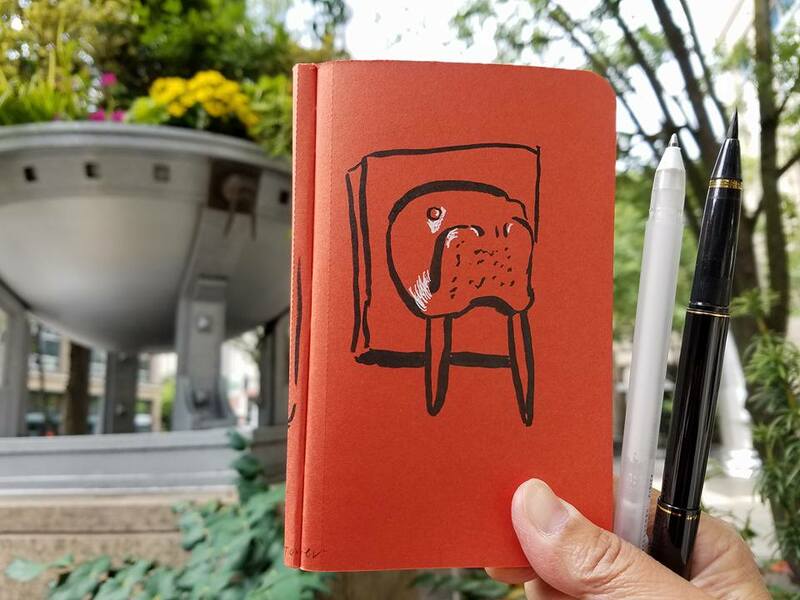 Instead of demanding that Field Notes be made to accommodate me, I now let the notebooks show me how I can use them to expand my sketching. Different media, different subjects, different attitude – sometimes I need a kick in the pants to make me try new things. 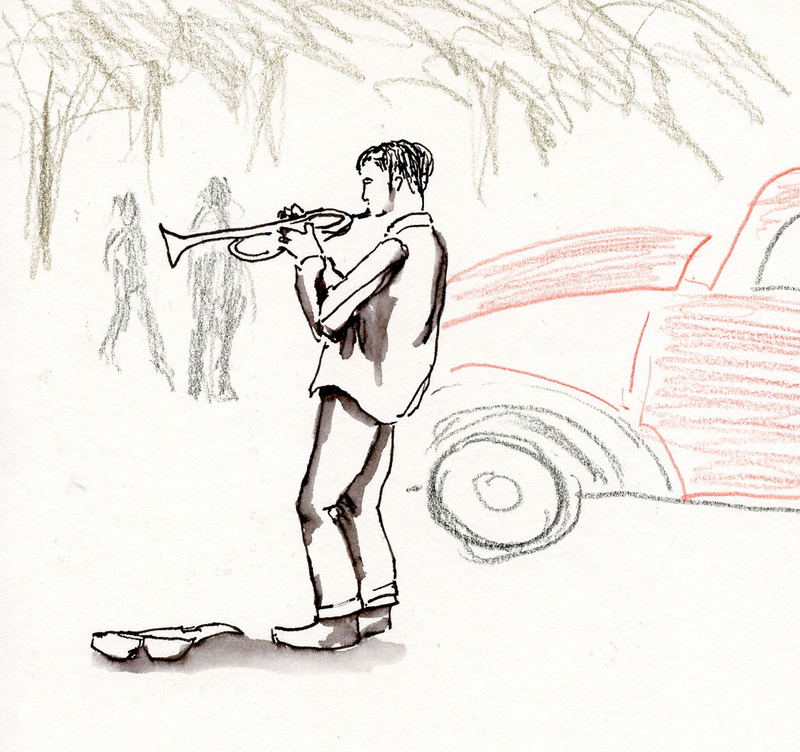 And sometimes that kick comes from the notebook. 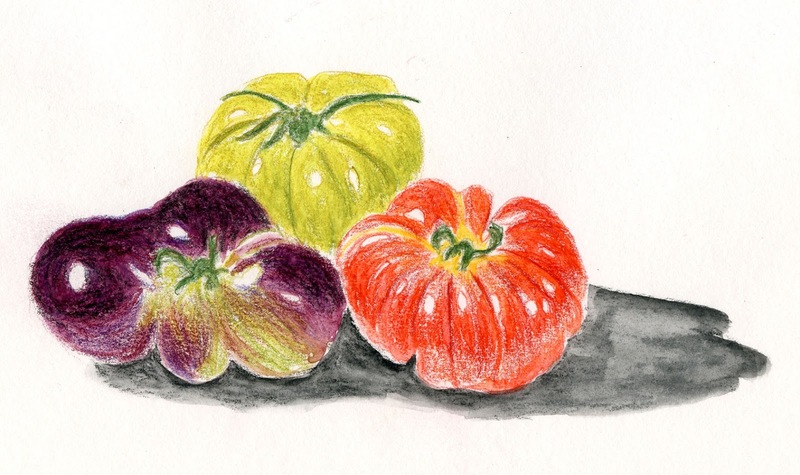 At the farmers market I saw the most amazing Heirloom tomatoes – so many different shapes and colors. I scrutinized all my choices closely and then carefully picked out three – not so much for salad potential but for still life potential. That was Saturday. 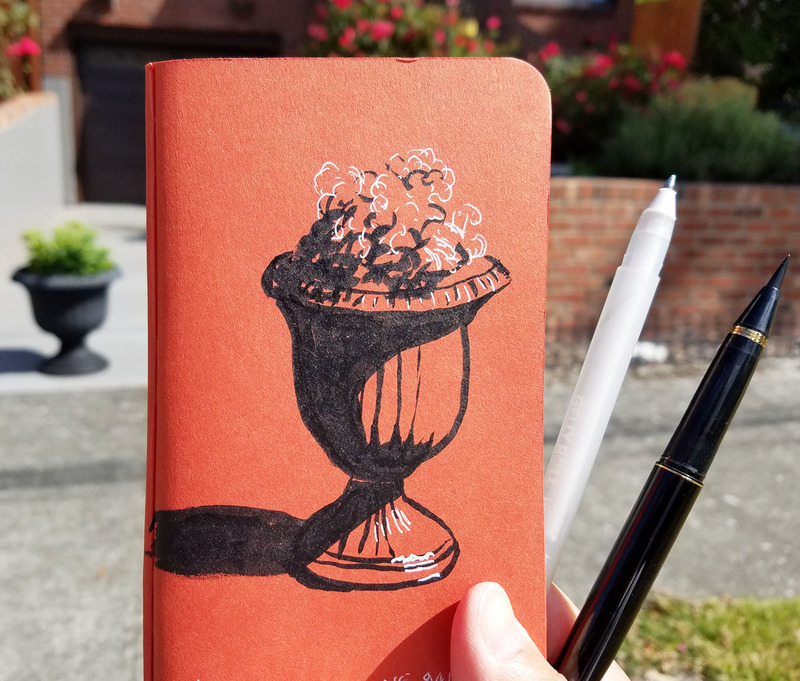 They’d been sitting on my studio table since then, waiting for me, but I’ve been happily sketching outdoors and haven't been in a still life mood. Greg has plans to eat them today, however, so I decided I’d better get on it. Abandoned furniture is most easily found toward the end of the month when tenants tend to move out, so I was surprised to see this one on my sketchabout today. 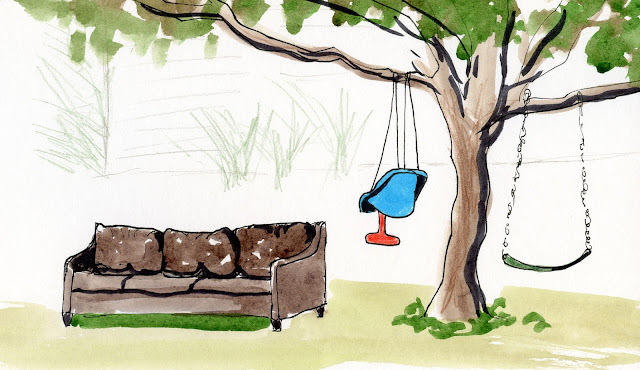 With the shade tree and two comfy swings, all they needed was a TV in the street to make this a complete family entertainment center. 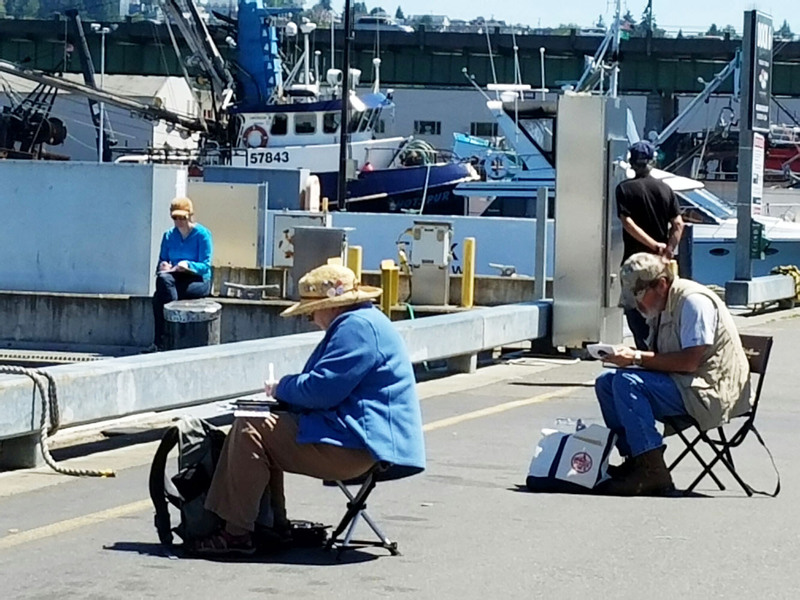 In the nearly five years that I’ve been sketching, farmers markets have always been among my most favorite summer places to sketch. 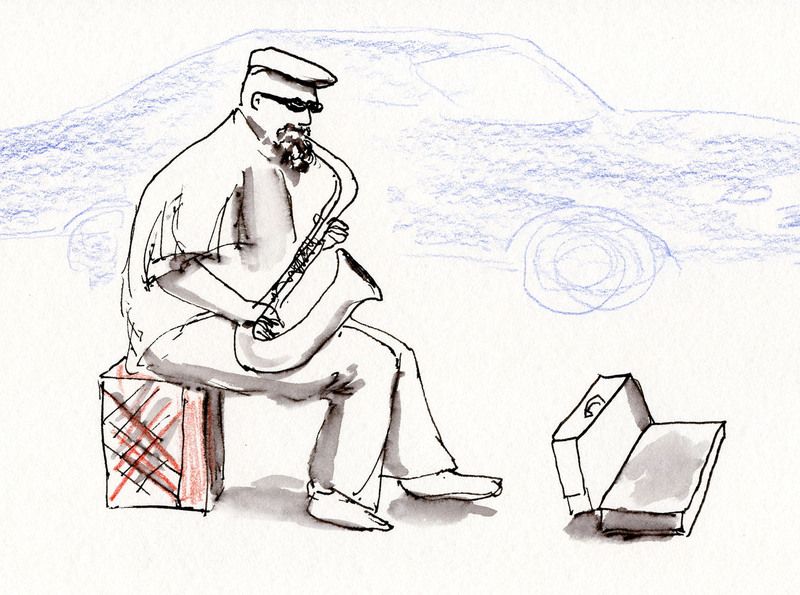 I enjoy sketching colorful flower vendors and fruit stalls, but by far my favorite subject is buskers. A few return every year and circulate to the various neighborhood markets, and one I’ve sketched perhaps more often than any other is P. K. Dwyer. 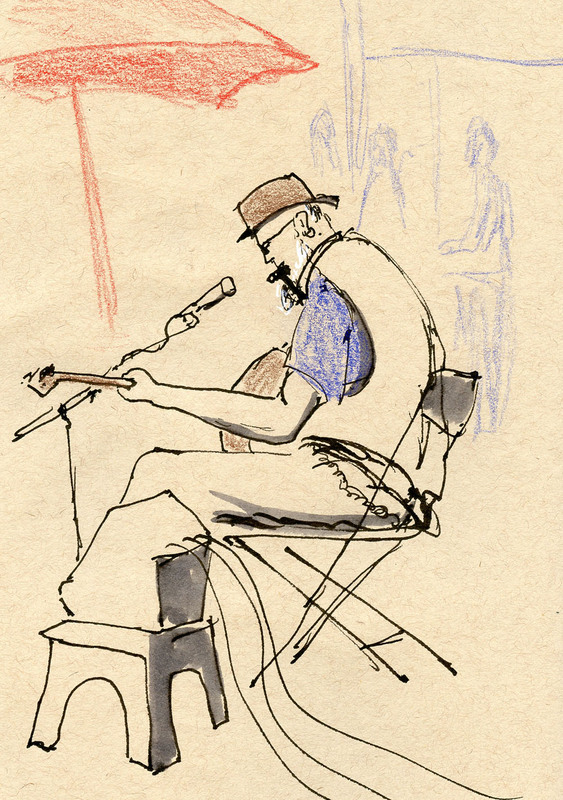 Jammin’ on his harmonica and guitar, this one-man band sings a bluesy mix of original tunes, always wearing his trademark hat. 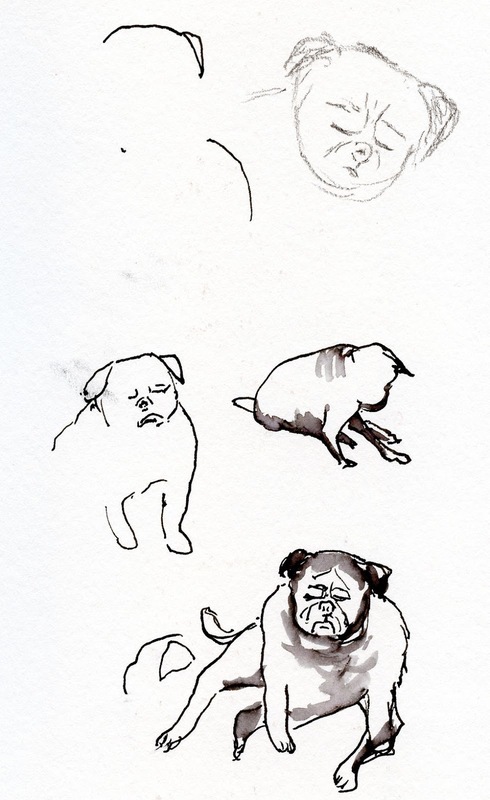 Here he is in 2013 and 2012. Another time on a rainy day, I sketched him from the back, trying to stay dry. 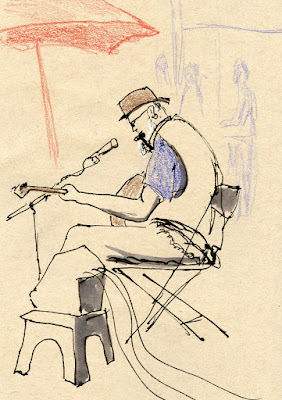 Last Thursday at the Lake City Market, I had already finished shopping for berries and was on my way out, but I stopped for another sketch of P. K. just starting his set. 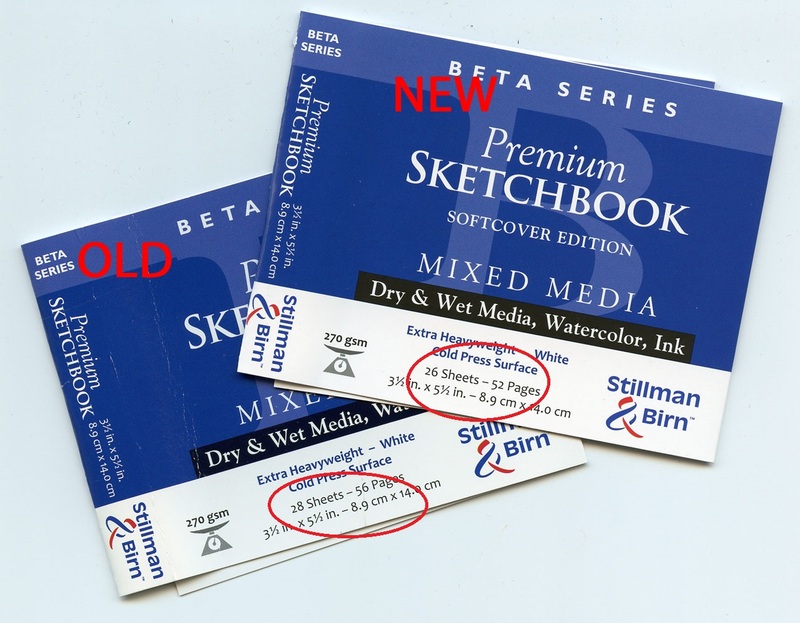 New and improved Stillman & Birn softcover sketchbooks. 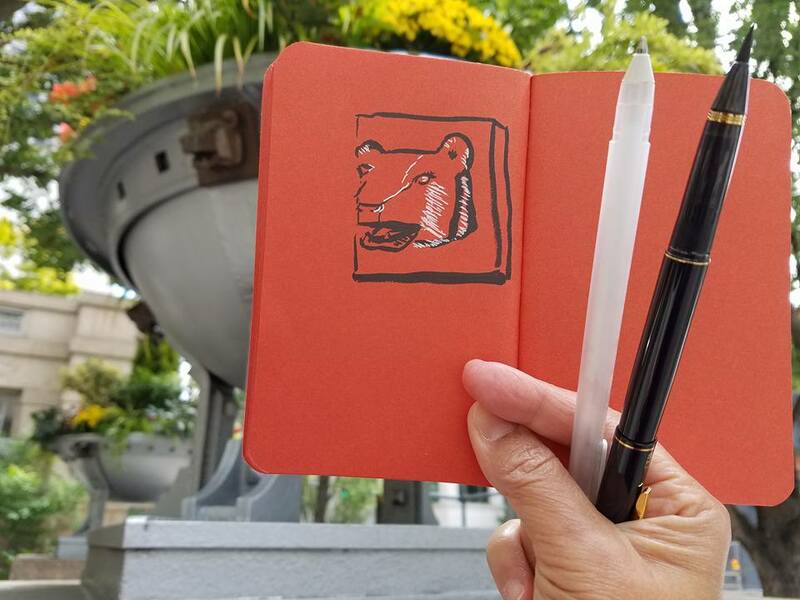 U.S. sketchbook manufacturer Stillman & Birn has been on a long, hard road since last autumn, but the journey has been worthwhile. 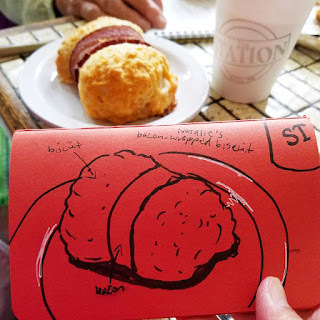 Shortly before the holiday season last year and to much consumer excitement, S&B announced a new product line: softcover versions of its popular sketchbooks. Thinner and lighter, yet still containing the papers I already know and love? I was among the excited! bad S&B Beta tore when opened fully. Unfortunately, my enthusiasm didn’t last long. 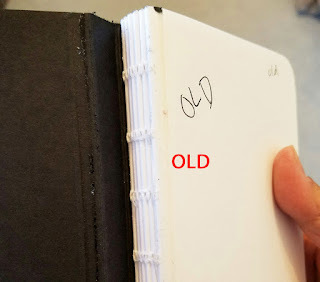 You can read my full review from last December, but here’s a summary of the main problems I encountered: In the small Alpha version, when I forced the book open at each page to make the spread lie flat, the paper tore away from the thread on most of the signatures. 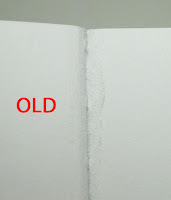 In the Beta version, which has heavier paper, the strip of adhesive between signatures was so wide that the spread could not be opened completely unless the pages were literally torn apart. 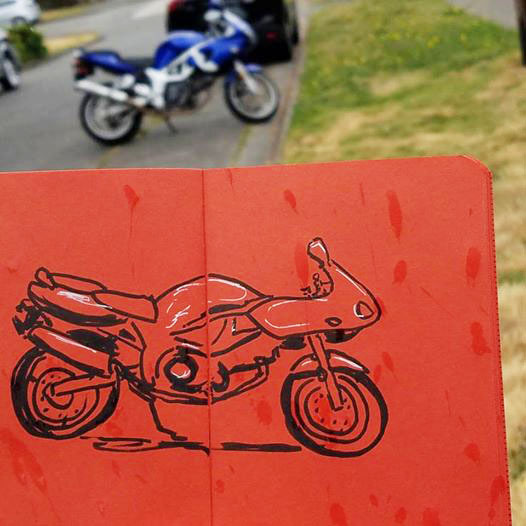 This was a deal breaker for me, as I often like to sketch across the gutter. It didn’t take long for word of these and other binding problems to spread around the interwebs. 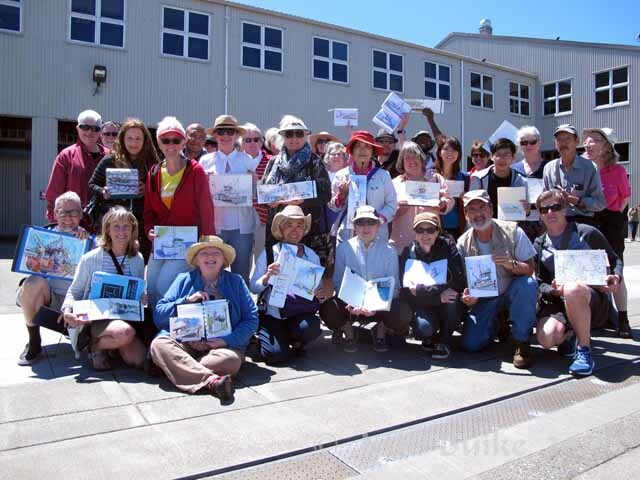 S&B responded by halting production and pulling the product line from distribution. (This was in the middle of the holiday shopping season – I’m sure it was a painful move.) Its website announced that any consumer who had purchased the bad books could receive a refund by sending a copy of the receipt indicating purchase price. It also reassured fans that the company was working hard to resolve the issues and put the softcovers back into production ASAP. 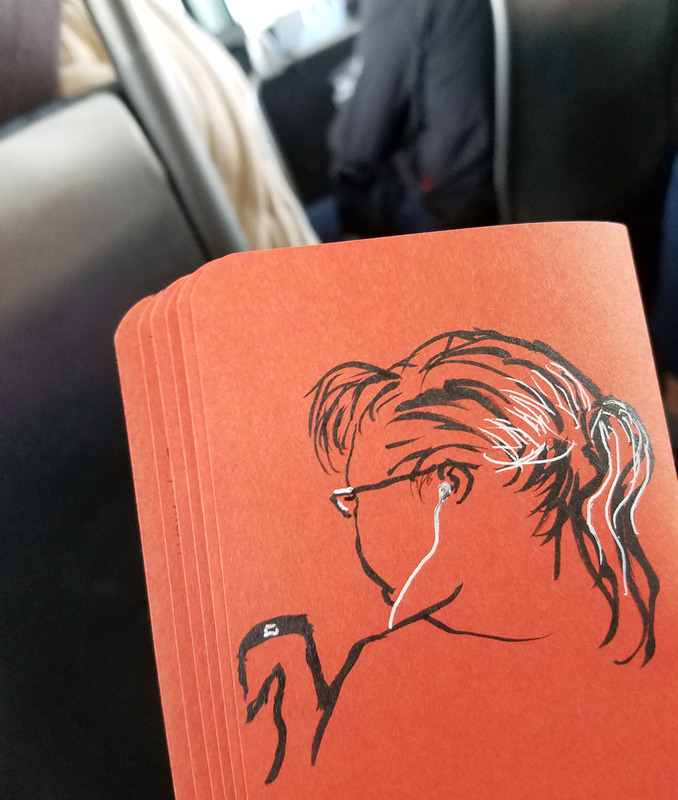 Beta book, but the paper didn't tear when spread open. I was one of the consumers who responded by submitting a receipt, but when I did, I said I didn’t want a refund – I preferred that the books be replaced after the problems had been resolved. I had enough faith in S&B’s previous commitment to high quality and customer service that the books would eventually be improved. completely separated from the book block. I’m happy to say that, for the most part, they survived my torture, and the bindings are distinctly different and improved. In no case did the paper tear away from the stitching. 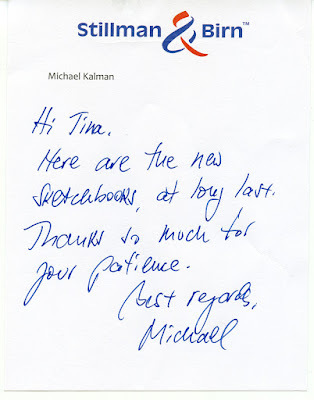 The adhesive between signatures is sufficiently narrow to reduce the stuck-together issue I encountered before. 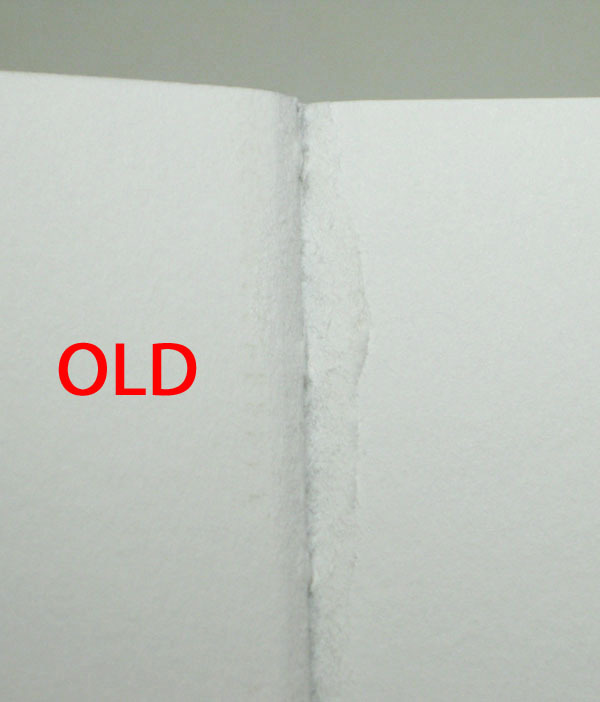 In a few cases in the Beta books, when I forced the page spreads open, the adhesive between signatures stuck enough that some paper fibers pulled up, but the pages didn’t tear, and the adhesive is visible in some places. 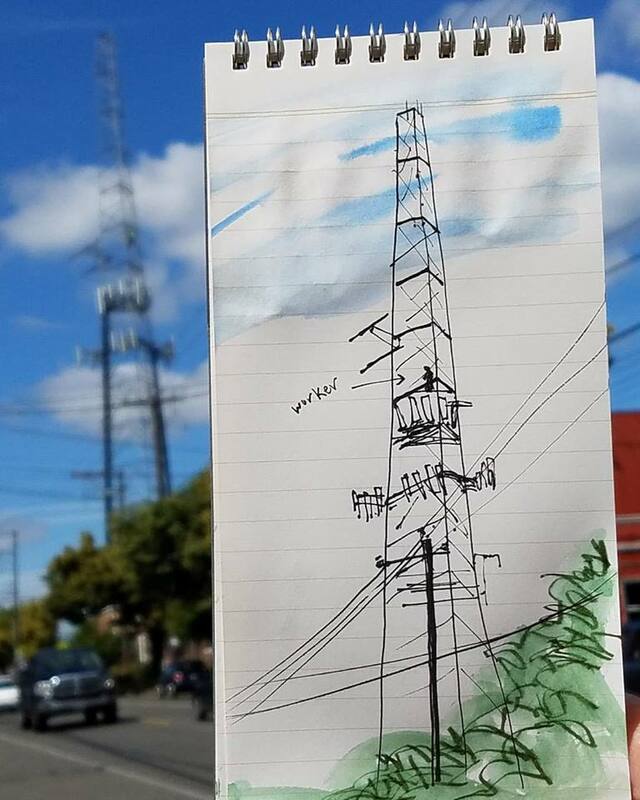 But this degree of sticking together is definitely tolerable and not a deal breaker for me, even if I sketch across the gutter. 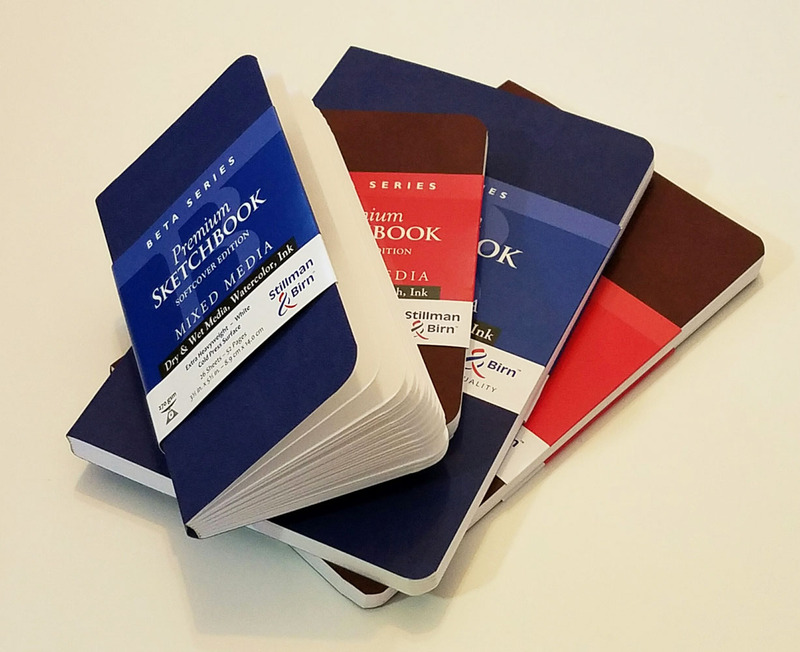 The Alpha books in both sizes are flawless. The new Beta's first page is glued completely to the cover. cover was attached to the book block only at the spine. 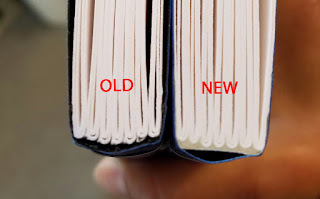 In the new books, the first and last pages of the book are completely glued to their adjacent cover, giving the whole binding more strength. On my cursory glance, I didn’t even notice this difference, but it became apparent when I pulled out the old books to compare them. 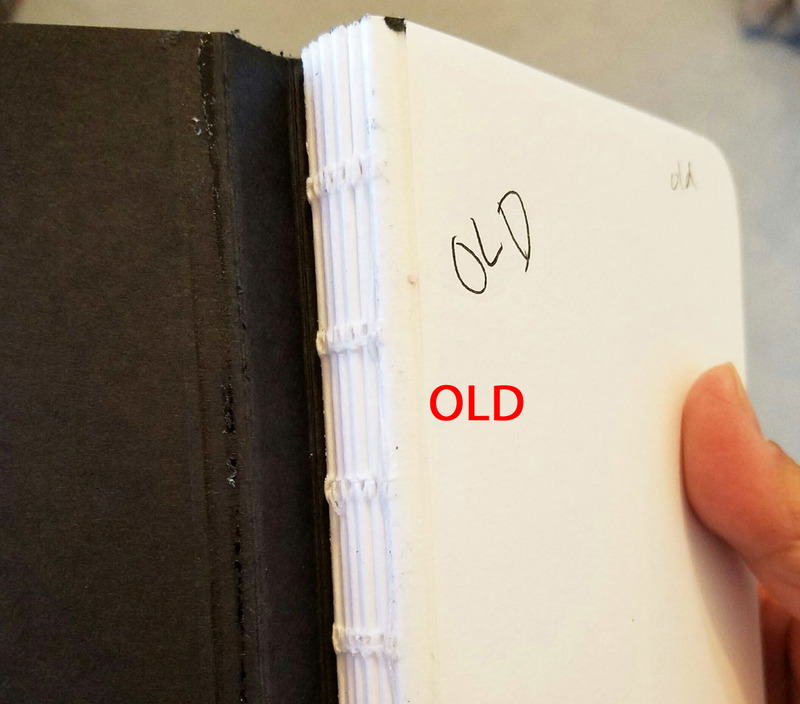 I opened the cover of my old pocket-size Alpha, which has been sitting quietly on a bookshelf for the past six months, and without any force, the cover came completely unglued from the spine! Note: The loss of those glued-on end leaves as useable pages is reflected in the page count. For example, the old Beta contained 56 pages, and the new Beta contains 52. For the Alphas, the page counts are 96 (bad books) and 92 (good books). There’s one more thing about the image above that’s important if you plan to buy the S&B softcovers: On a shrink-wrapped product, it’s one of two ways you can tell the difference between good and bad stock. The second way is the page count. I compared all the belly bands, and they are identical in every way except for the page counts noted above. In theory, all the bad books were pulled from retail stores as soon as the binding issues came to light. But it’s possible that some stores still have old stock that may remain mixed in when new stock hits the shelves. If you order online, it would be worthwhile to ask to make sure you are getting new stock, and you can use the number of pages as reference. 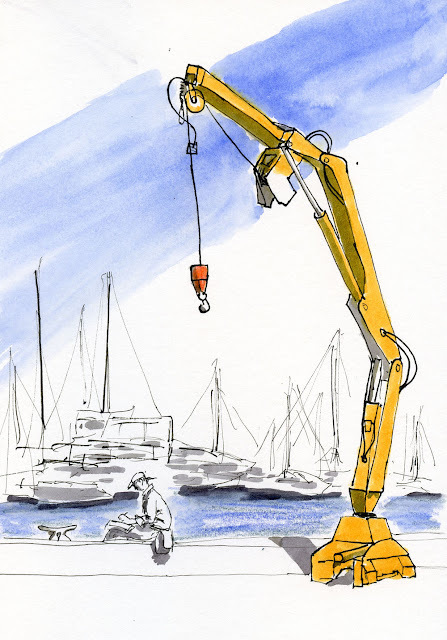 Good work, S&B – I’m a fan again! 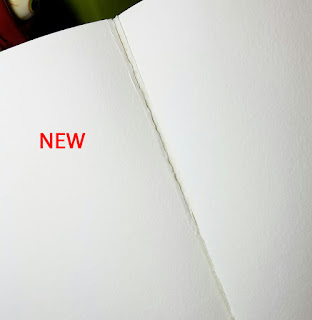 And how does this new-and-improved softcover affect me and my sketching life? I’m not sure. I’ve been happily binding my own the past three years, but I occasionally feel belabored by my own process. More significantly, my handbound books, which, I admit, look beautiful together on my bookshelves, take up a lot of space. In my current format of four sheets per signature, I get 96 pages per book. 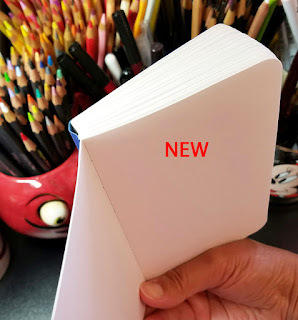 Three softcover Beta books would take up the same horizontal space on a bookshelf as one handbound book – but I’d get 156 sketchable pages in that space. A 5 ½ by 8 ½ softcover Beta book is about twice as heavy and thick as one of my hand-stitched signatures, but also a tiny bit smaller. Once I bind my current stack of signatures, I’m going to start using and carrying that Beta and see how it feels. Now that I’m confident the binding isn’t going to fall apart, I’d be happy to go back to S&B, but there are other factors to consider. We’ll see. 9/6/16 I filled the softcover Beta, and here's the post with my conclusion.